An ingenious invention by a student at the Universality of California. Made from 100% organic cotton with folding pages just like a book. Replaces disposable tissue and has many uses. 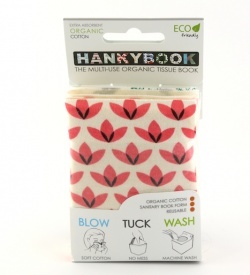 Another product that promotes the joy of reusables for a new generation, The HankyBook! Made by an Engineering student at the University of California. It's reusable, pocket/purse friendly, prevents rednose and machine washable. Handmade from 100% organic cotton knit fabric. It has 8 absorbent folding pages which are bound together like a book. They have cute cover designs which you hold so your hands do not get dirty. Then closes so your pocket doesn't get dirty either, genius! The HankyBook has many uses. It can replace disposable tissues, napkins, baby wipes and is also great to take backpacking. Generally, just take care of your HankyBook like you would a traditional handkerchief. This hanky has eight pages, meaning you will get many uses out of it before it's time to wash it. When it's time to wash just throw them in your machine with your clothes. No special tricks required. The only reason I gave this 4 stars instead of 5 is that I think it would be even better with some kind of closure, like a snap, &/ a small pouch to keep it in.